About a month ago I received an email from Davidoff of Geneva letting me know that I had won a Davidoff No. 6, 50 count humidor in the Viva Davidoff contest. Well after a long, long, month it arrived today. Let me say this is one beautiful piece of furniture! 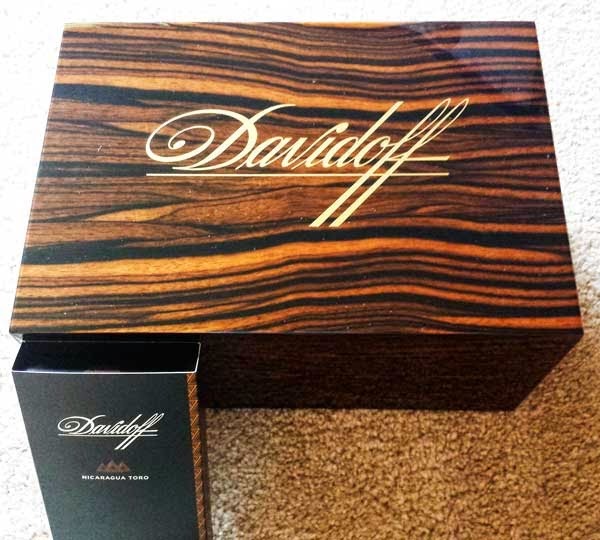 Along with the humidor, Davidoff included a four-pack of Nicaragua Toro cigars. These will be the first Davidoff cigars I've had a chance to smoke so look for a review. Actually once the humidor is seasoned and in operation, I'll review it too. I would like to thank Davidoff Cigars for this fantastic prize. Thank you!